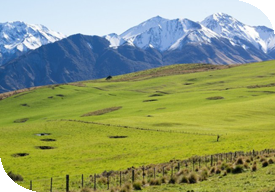 A large North Canterbury sheep and cattle-breeding property, subject to a substantial recent improvement programme, is for sale. Mason Hills, Waiau, a 2542 hectare pastoral farm with an established homestead, a spectacular alpine outlook and impressive infrastructure, is offered for sale by auction through PGG Wrightson Real Estate. Peter Crean is marketing the property. He says its present owners have transformed Mason Hills. Over the past six years, this expansive property has become a genuine large-scale sheep and cattle-breeding unit with enviable productivity. Since 2009, under current ownership, a concerted schedule of improvements has included an aggressive fertiliser programme; outstanding re-pasturing; 31 kilometres of new fencing; and first-class husbandry. As a consequence of that, Mason Hills has become an exceptional farm. Its proximity to two thriving and diverse rural towns, Hanmer Springs and Kaikoura, as well as nearby skiing, fishing and mountains, creates a striking balance of business and leisure, he said. Situated 55 kilometres southwest of Kaikoura, 68 kilometres northeast of Hanmer Springs and 160 kilometres north of Christchurch, Mason Hills comprises approximately 47 per cent medium hill country, with some flats, and the balance classed as medium to steeper country. It sits between 420 and 861 metres above sea level, averages between 1,000 and 1,250 millimetres of rainfall per annum and is divided into 71 paddocks, mainly via more the recently erected post and seven-wire fencing. Over the past six years, approximately 120 hectares have been cultivated, brought into new pasture and optimally fertilised. Mason Hills winters 4,500 Perendale ewes and 450 Angus and Angus Cross breeding cows, achieving a lambing percentage of 141 per cent and a calving rate of 92 per cent in recent years. Its natural supply of water enables dams or creeks in every paddock, which is further enhanced by a new stock water scheme incorporating 100,000 litres of storage tanks covering approximately 120 hectares. Domestic water is sourced via an easement from a neighbouring property's well. Peter Crean says Mason Hills' homestead matches the quality of the farm. A large, five-bedroom wooden character home, with some stonework, the homestead has one main bathroom, two en suites, three toilets, two lounges, one formal dining room and a modern kitchen that was installed in 2005. Set in a large, established garden and enjoying exceptional views across farm paddocks to bush-clad hills and Mt Lyford ski field, the home has a CRV heat transfer system to five rooms and hallways, and rimu joinery throughout. A two-bedroom self-contained shepherd's accommodation unit is also situated on the farm. In addition to its premium farming features and high-quality home, with skiing at Mt Lyford, the Hanmer Springs thermal resort, fishing and boating on the Waiau River and golf at Amuri, Mason Hills will provide its new owner with the ultimate combination of income and lifestyle, he said. Mason Hills goes to public auction at 2pm on Thursday, 12 March 2015 at The Tea House, Riccarton Park, Christchurch. Peter Crean, tel 03 341 4315, or 027 434 4002.